CJ STANDER HAS had another immense half in the green of Ireland. Reminiscent of his debut against Wales, Stander’s appetite for work has been obvious in the first 40 minutes against Scotland. This stunning solo effort from Scotland fullback Stuart Hogg, after he fielded a Conor Murray box-kick and spotted a mismatch in the Irish defence, got the Scots’ noses in front 10-9 after 20 minutes. However, Ireland put pressure on 14-man Scotland, who lost Johnny Barclay to a yellow card for an infringement, and were camped on the Scottish line after an attacking lineout. They were struggling to get over the whitewash, making little headway, until Stander took control. The back-rower decided to dive over the top of the ruck to touch down in style and put Ireland back in the lead. Earls, winning his 50th cap today, added to Scotland’s woes when he touched down after a Sexton kick caused confusion in the Scottish defence. A late Greg Laidlaw kept Scotland in touch to leave the half-time score at 21-13. Email “CJ Stander channelled his inner NFL player to get over the Scottish line”. 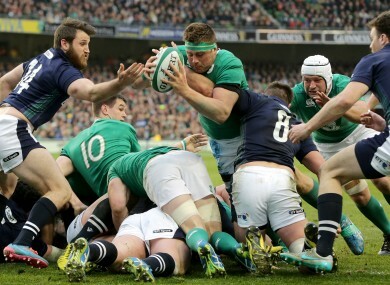 Feedback on “CJ Stander channelled his inner NFL player to get over the Scottish line”.